Red shoes according to the Hans Christian Andersen fairytale were the ultimate vanity and cursed the wearer. In the Tom Waits’ song, Red Shoes by the Drugstore, Little Caesar gets caught stealing a diamond ring for his baby all because “he loved the way she looked in those red shoes”. 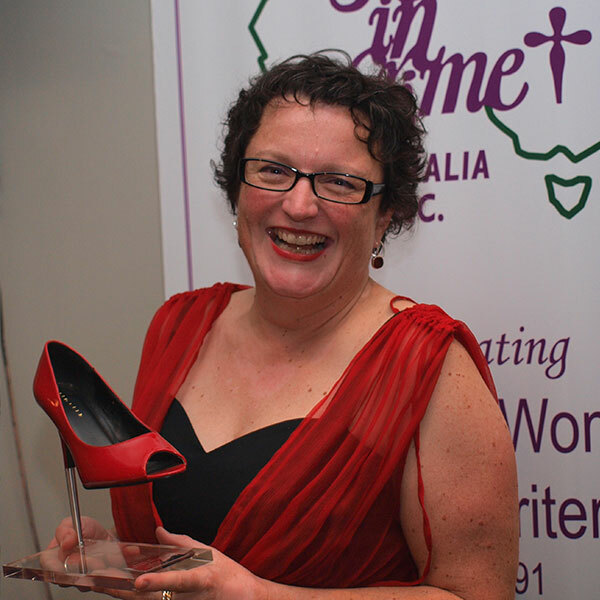 Red shoes, it seems, bring only trouble—unless you’re one of the 14 women who has won the Scarlet Stiletto trophy for best unpublished short crime fiction since the award was launched by Sisters in Crime Australia twenty years ago. Essie Davis, star of Miss Fisher’s Murder Mysteries, will present the 20th trophy at a gala dinner in the Thornbury Theatre Ballroom at 6.30pm Friday 22 November. “This single event set me on a path which hasn’t petered out yet,” Cate Kennedy says of winning the inaugural Scarlet Stiletto in 1994 for her story “Everything $2.00 On This Rack”. An unknown at the time, Kennedy has since been published across a range of genres, winning a dazzling array of literary awards. Kennedy’s is not the only writing career nurtured by the Sisters in Crime through the annual Scarlet Stiletto Awards short story competition. Shute says the awards originated from a meeting over a few glasses of wine about the difficulties facing female aspiring crime writers. “Despite the success of writers like Claire McNab, Kerry Greenwood, Susan Geason and Marele Day, women crime writers still lacked proper recognition in Australia,” Shute says. “The Sisters in Crime saw the Scarlet Stiletto Awards as a way of cutting through the discrimination. The competition is open to women residents of Australia. All stories must contain an active woman protagonist and a crime/mystery theme. The augural Scarlet Stiletto Award offered $625 in prize money. This, $7,000 is up for grabs, with awards offered in 13 categories in addition to the coveted first prize trophy. The basic design of the trophy – a scarlet shoe with a steel heel stiletto plunging into a mount – has changed little since 1994. Most of the trophy shoes are sourced second-hand or bought on sale. One was found abandoned in a gutter in St Kilda. The Best New Talent Award is sponsored by Kennedy, who won a second shoe in 1995 for “Habit”—the first of five women to date to win two Scarlet Stilettos, although the only one with a matching pair. Past winners speak overwhelmingly of the role of the Scarlet Stiletto Awards and the Sisters in Crime in giving them the confidence to write. Josephine Pennicott won first prize in 2001 for “Birthing the Demons”, a story inspired by the treatment of the mother of one of the children who murdered two-year-old James Bulger. Pennicott, who has published a trilogy of fantasy novels and whose Tasmania-based mystery Poet’s Cottage, recently attracted a bidding war in Germany, won a second shoe in 2012 for “Shadows”. Other mismatched pairs have been won by Christina Lee, Roxxy Bent and Janis Spehr. In addition to Kennedy and Pennicott, 15 previous winners in different categories have gone on to have books published: Patricia Bernard, Margaret Bevege, Bronwen Blake, Sara Evans, Liz Filleul, Kylie Fox, Simmone Howell, Cheryl Jorgensen, Jo McGahey, Ellie Marney, Tara Moss, Alex Palmer, Inga Simpson, Amanda Wrangles and me. Winning third prize in 1998 was enough to convince me to persevere with writing crime, and the main character in my story, Jayne Keeney, went on to become the hero of my three PI novels based in Thailand. Ellie Marney left her husband and a plumber dealing with a rat’s nest in the walls of her home in rural Victoria to attend the Scarlet Stiletto Awards dinner in 2010. Amanda Wrangles’ 2009 winner “Persia Bloom” was the first story she’d ever shared outside her writing group. But the benefits of the awards extend beyond book deals. Evelyn Tsitas won the Dorothy Porter Innovation Prize in 2007, before taking home the Scarlet Stiletto in 2008 for “Undeceive”, a story in verse. “Winning the coveted red shoe opened doors within the crime writing sisterhood, and also gave me the confidence to stamp myself with the ‘crime writing’ brand even though I haven’t had yet had a crime fiction book published,” Tsitas says. Aoife Clifford won the red shoe in 2007 for “Kill-Dead-Garten”, was runner-up in 2009, and has three other prizes. Perhaps the most apt metaphor for what the Scarlet Stiletto Awards have meant for so many of us comes from my seven-year-old, who recently confessed she and her friends play a game with the trophy I won in 2011 for “The Teardrop Tattoos”. Angela Savage is the author of the Jayne Keeney PI series set in Thailand and is a member of Sisters in Crime Australia.